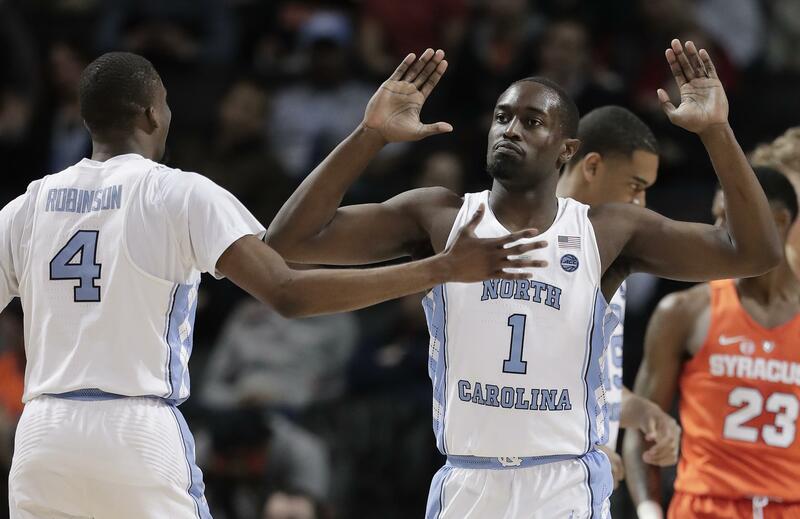 Wed., March 7, 2018, 8:56 p.m.
NEW YORK – Theo Pinson had 16 points, 11 rebounds and six assists and Kenny Williams scored 17 points as No. 12 North Carolina beat Syracuse 78-59 on Thursday night to advance to the quarterfinals of the Atlantic Coast Conference Tournament. The Tar Heels honored Durham, who called North Carolina games for 40 years, by wearing white warm-up shirts that had “Woody” written in black letters across the backs. Coach Roy Williams wore a black suit with a Carolina blue ribbon lapel pin. Durham’s son, Wes, was courtside calling the game for Raycom Sports. North Carolina controlled the last 10 minutes of the first half and built a 39-29 at intermission. Then the Tar Heels used a 12-4 surge to start the second half, with Williams dropping in a 3 to prompt a timeout by Syracuse, to take a 51-33 lead with 15:35 left. North Carolina shot 44 percent against the Syracuse zone, with Pinson picking through the seams and hitting the boards and Williams doing damage in on the break. The lead was up to 21 a minute and a half later when Williams slipped a pass to Cameron Johnson trailing in transition for a layup. Syracuse: The Orange entered the day with an RPI of 36 and coach Jim Boeheim has been touting good road victories against Louisville and Miami. Using advanced metrics, which the selection committee will consider, the Orange don’t stack up quite so well. They were No. 51 in KenPom ratings before playing North Carolina. And they finished 9-11 against ACC competition. Syracuse will have an uneasy wait until the field of 68 is unveiled. Published: March 7, 2018, 8:56 p.m.